Invasive breast carcinoma is a malignant epithelial lesion derived from the terminal duct lobular unit of the breast. Breast carcinoma is common, and it is estimated that one in nine women will develop breast cancer in their lifetime. Breast cancer arises anywhere in the breast parenchyma or accessory breast tissue, although most common in the upper outer quadrant. 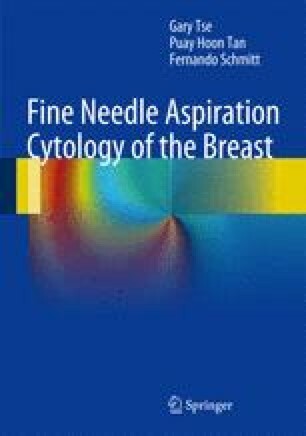 The main purpose of the identification of specific types of invasive breast carcinoma is to refine the prediction of likely behavior and response to treatment offered by the other major prognostic parameters such as lymph node stage, histological grading, and tumor size and lymphovascular invasion. A wide range of clinical behavior is seen with different morphologies. Some patients with small tumors are cured by surgery, while others will die of metastatic disease within a few years. There is an increasing frequency with increasing patient age. Breast carcinoma is rare before 30 years without a family history of breast cancer. Clinically, breast carcinomas present most commonly with an ill-defined mass, sometimes adherent to skin or underlying muscle. When impalpable, breast cancer can be detected by mammographic screening program.